In the 1800s both men and women took great pride in their hats. Indeed, they were often the most expensive items in their wardrobes. Hat etiquette was strictly followed and became second nature to gentlemen and ladies in Victorian times. It was very rude for a gentleman not to remove his hat when he entered a building, although it was acceptable for a woman to leave hers on. Gentleman tipped their hats to strangers and removed them with a flourish when greeting ladies with whom they were acquainted. This hat warehouse clearly caters for the less well-heeled gentleman. As well as boasting its low prices, it also begins with an anti-landlord quotation: "Your bone and sinew pays 30 [shillings] to the Landlord's 1 [shilling] in Income Tax." The implication here is that fashion and esteem should not just be for the rich. 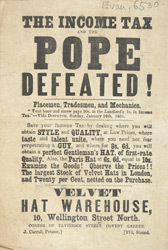 The advert is also an example of mid-Victorian anti-Catholicism. In an age of social rigidity, this was a surprisingly classless hatred. Queen Victoria urged her prime minister William Gladstone to "throw dirt" on the 1870 Vatican Council. Gladstone himself said that noone could submit to the Church of Rome and remain mentally and spiritually free. In 1874, even a Times editorial would opine: "To become a Roman Catholic and remain a thorough Englishman are almost incompatible conditions." This reflex association of Englishness and Protestantism was an important psychological bulwark against England's nearest and most troublesome neighbours - the predominantly Catholic Ireland and France.